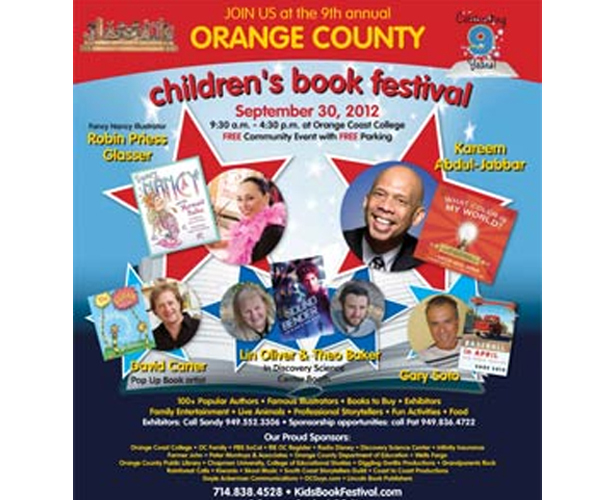 Fuddles goes to the Orange County Children’s Book Festival! yay! frans will be at the book fair this sunday to sign fuddles books and draw for the kids! lots of people are coming! i wish i could go too, but i just don’t like crowds. too many feet that step on my tail or soft drinks getting spilled on my head. i’ll stay home and just pretend i’m there. i guess i just have to wait for dinner now. i was having a nice catnap on the couch dreaming i was a superhero with super strength and speed and i jumped from buildings to cars and to trashcans and i chased bad guys all over town and beat them up. it was a long dream. i did lots of running and kicking and flying, and then i took a really big jump and then i woke up on the floor! all that activity made me so hungry that i went straight to the kitchen. and what luck- i was just in time for dinner! rolled turkey quesadillas with chopped apples and whipped cream cheese and honey and whole wheat tortillas and shredded smoked mozzarella! oh, i can have a whole dream about that- a superhero dinner! sometimes when i’m out exploring the sprinklers go on without warning, and i have to scramble for safety! you have to be quick on your toes, and sharp of the brain to survive out there. you gotta know when to hold ’em and when to fold ’em, so then i just go back to my comfy couch for a nice nap. and after that it’s dinner time. i’ve been smelling yummy aromas from the kitchen- my finely tuned senses tell me we’re having pork dumplings tonight. i detect the grated fresh ginger and green onions and napa cabbage leaves, all smothered in soy sauce. 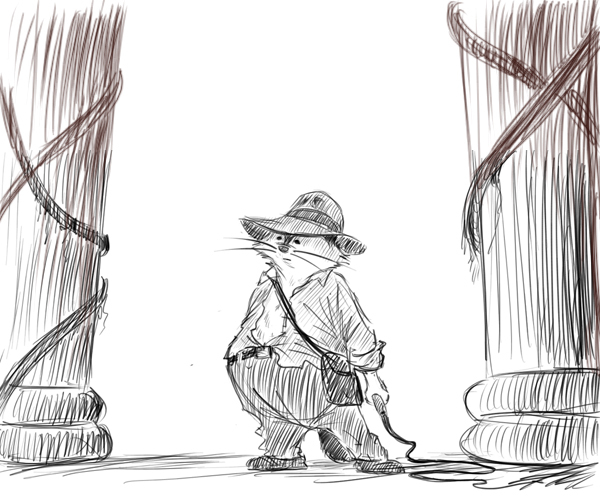 my family was watching a movie where a guy in a funny hat and a whip had a bunch of adventures, just like me! i climb the backyard fence just before the neighbor’s dog gets me. a fraction of a second later would have been the end of me. or i scramble out of the way of the vacuum cleaner just in the nick of time! us adventurers must be quick on our feet, and nimble in our brains. you gotta think fast- it’s a dangerous world out there! just today someone nearly tripped over me. i was clearly heading into the living room, which i always do after my 2 o’clock afternoon water break, (when will they learn my routine..?!) and i nearly got trampled by someone carrying a big stack of books! they stepped right in front of me so i moved one way and they moved that way too, so i moved the other way and so did they! and then a couple of heavy books crashed on the floor just inches from me! thank goodness i’m such a sharp kitty. with laser precision i darted between their legs and onto the couch where i was safe. i hope my family appreciates the things i put up with! for my reward, i deserve a nice steak dinner with a baked potato and worcestershire sauce and sour cream and cheddar cheese. the adventurer’s adventure- out in the wild, at one with nature! 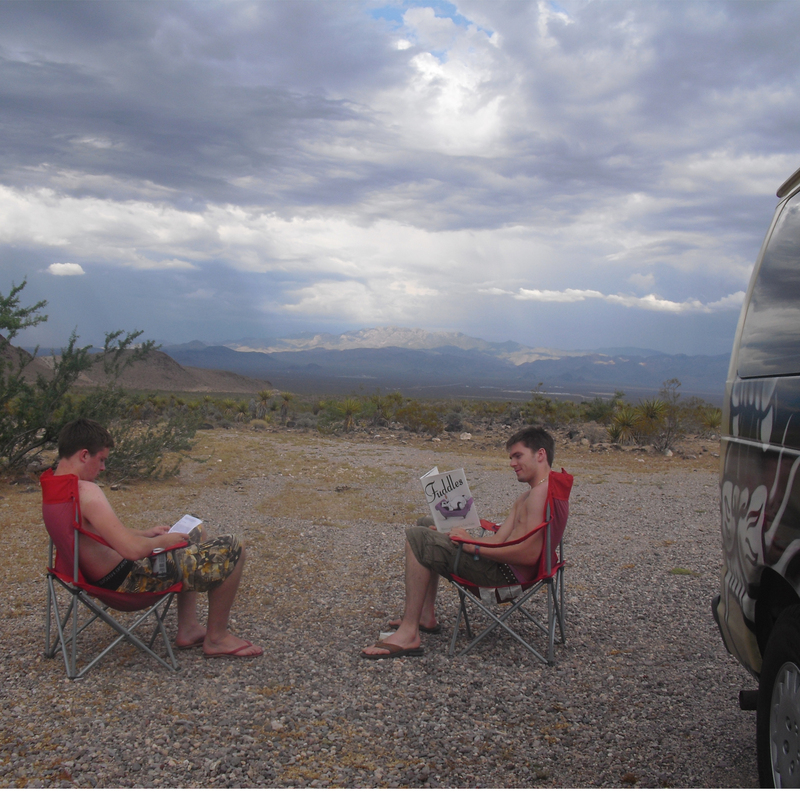 camping is the adventurer’s true love. exploring, taking long hikes and seeing new sights- that’s the thing for me! and after an adventure-filled day, it’s baked beans and franks cooked over a fire for dinner and smores for dessert. and then ghost stories told around the camp fire, followed by sleeping under a starry sky. what could be more exciting than that? listening to the coyotes howl, the mountain lions growl. that’s a little scary, actually… i think there are eagles out there with big claws, hunting at night. and aren’t there snakes out in the desert? that’s very scary!! i think i’ll just stay home and have hot dogs and beans here and sleep on my comfy couch pillow. i can dream about all that camping stuff! Waking up on a traffic light?! i was having a really nice nap and i was dreaming about living in the big city with all the busy cars zooming by and lots of people rushing around and all the noise. 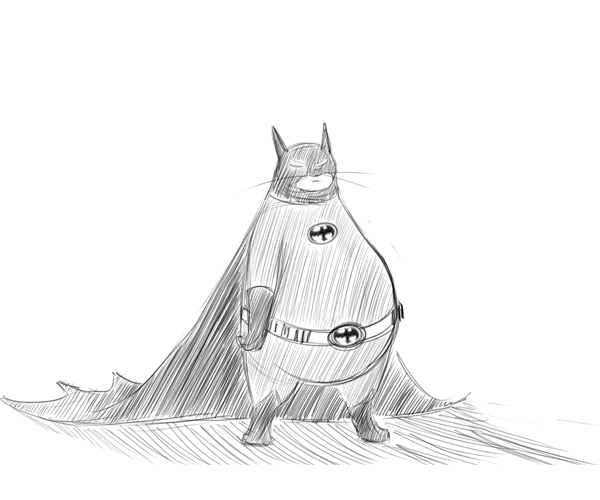 it was kind of scary but i was a fast, strong super cat, so nothing scared me. i jumped on top of the cars and buildings and bus stops without ever getting hurt. i was a risk taker! no leap was too big for fantastic fuddles! 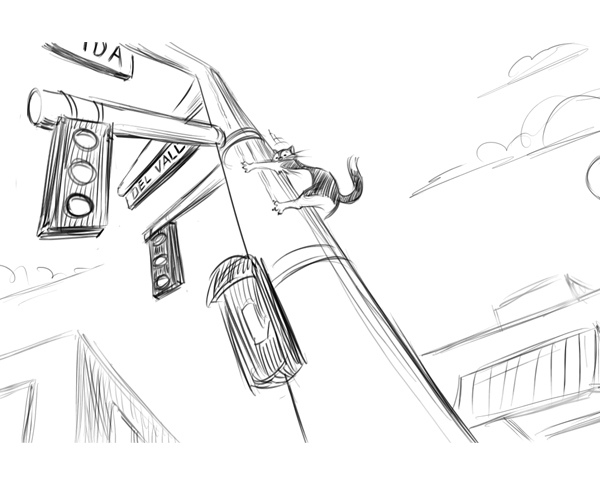 then a really loud woke me up and i was lying on top of a really high traffic light! all the traffic was moving below me and making lots of noise! i got really scared! heights make my tummy get all queezy! but i had to get down, so i gripped my claws as tight as i could around the traffic pole and very slowly i started sliding down. i kept my eyes closed, or i would have fainted for sure! i started sliding faster. i gripped the pole as hard as i could, but i was sliding really fast and then i bumped down on the sidewalk and suddenly i woke up on my couch. i was a little puzzled because i was having a dream of a dream! wow! i was really confused. i looked around the house and touched all the furniture to make sure i wasn’t having a dream of a dream of a dream! then i smelled dinner cooking in the kitchen and i knew everything was right! especially because mom was cooking tuna melts with swiss cheese and home-made fries! 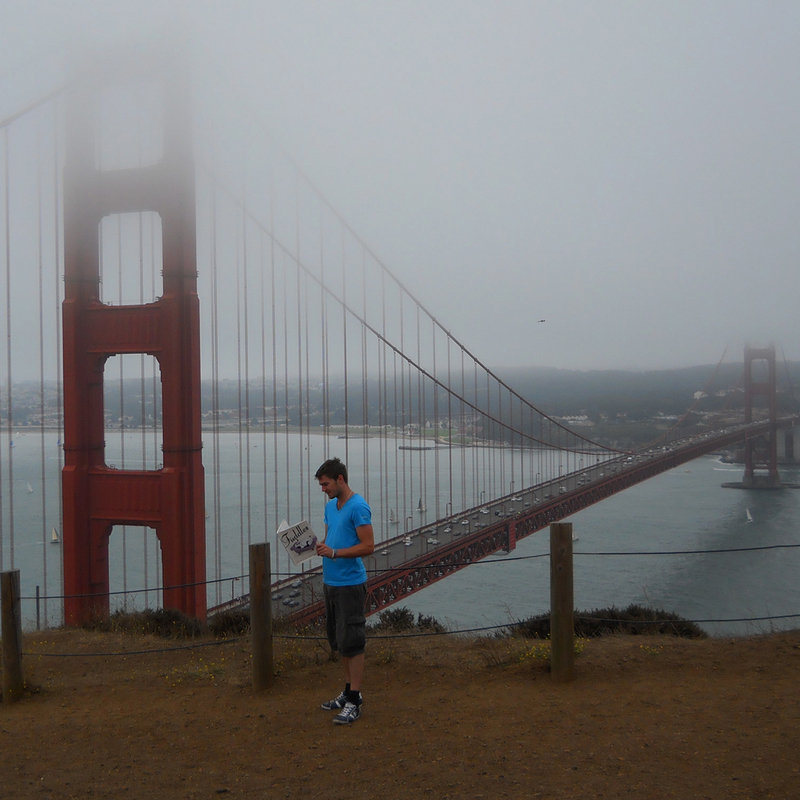 Fuddles sighting at the Golden Gate bridge! brrrrr! it looks really cold in that picture! 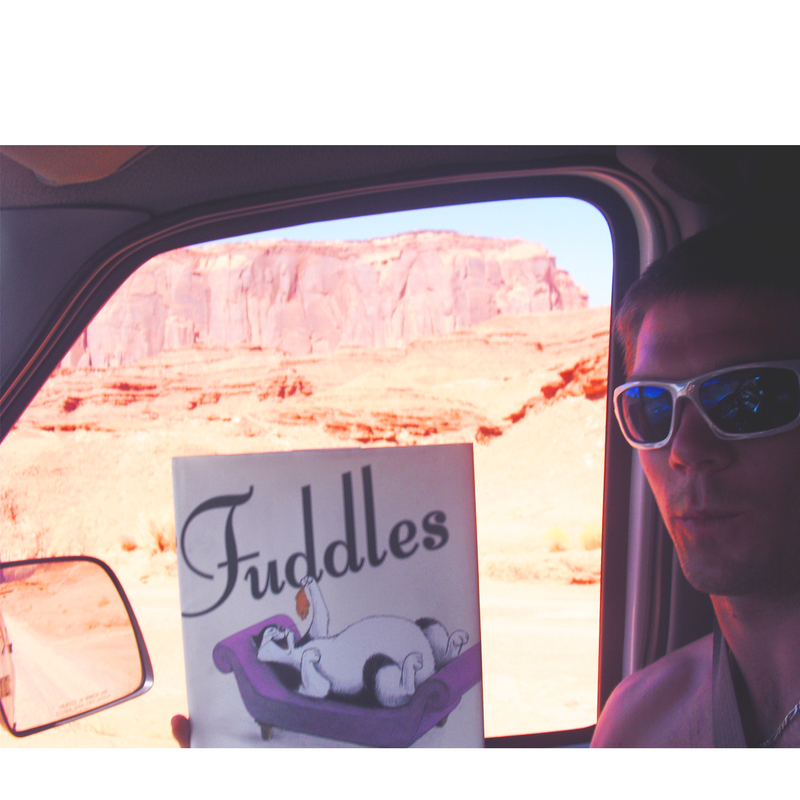 i don’t know why this man is reading fuddles out there. i’d much rather be on my couch, taking a nap. i can easily dream about being in a cold place while being nice and warm inside. i do like adventures- seeing and trying new things are great, just as long as i am comfortable and it’s not too much exercise and i have lots of rest and food. to me a great adventure is trying something new for dinner. like tonight- we’re having argentinian steak with chopped parsley and chili pepper flakes and minced onion and cayenne pepper and a few tablespoons of sherry wine.